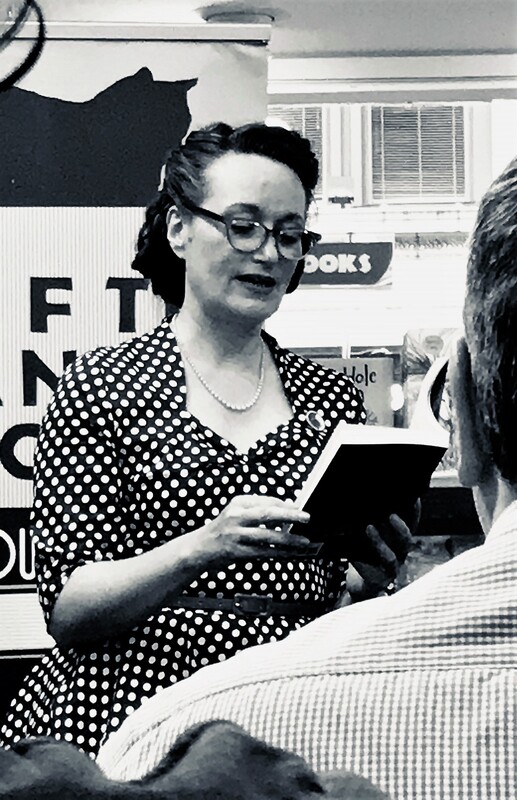 Mary Robinette Kowal is the author of Ghost Talkers, The Glamourist Histories series, and the Lady Astronaut duology. She is a cast member of the award-winning podcast Writing Excuses and also a three-time Hugo Award winner. Her short fiction appears in Uncanny, Tor.com, and Asimov’s. Kowal, a professional puppeteer, also performs as a voice actor (SAG/AFTRA), recording fiction for authors including Seanan McGuire, Cory Doctorow, and John Scalzi. 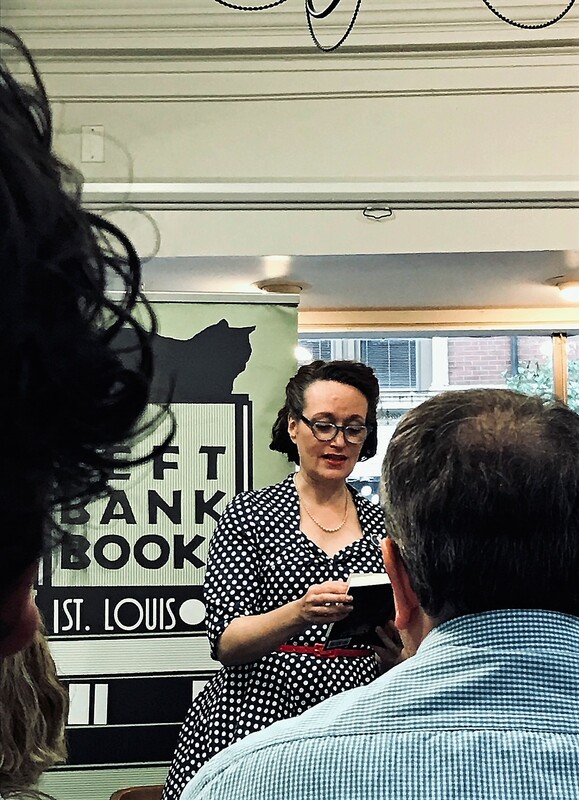 She stopped by Left Bank Books on August 27th for the local launch of the second book in her Lady Astronaut duology, The Fated Sky, where she sat down with Sheyna Gifford, a St. Louis physician and simulated astronaut. They discussed Kowal’s writing, Gifford’s experiences in NASA’s one-year Mars simulation, and martinis. (Read the books and you’ll be craving one!) The two women captivated the audience with their easy rapport and obvious passion for space and humanity’s next chapter as we push toward a manned Mars mission. My favorite bit came during the Q&A session when Kowal, a consumate storyteller, gave an off the cuff description of a night launch that had the entire audience held still and silent. Despite her argument that you really have to experience one in person to understand the awe of it, I think the next best thing is hearing it so lovingly detailed by her. Before the event, Mary was kind enough to sit down with me and answer some questions. The Arts STL: Your Lady Astronaut duology of The Calculating Stars and The Fated Sky are set in an alternate history, beginning in the 1950’s, where the the space race and the civil rights movement are accelerated, but some readers might be surprised to know how much of the story can be traced back to actual events and people. Do you have a piece of research from either of the books that especially surprised or delighted you? Mary Robinette Kowal at Left Bank Books. Photo by Zoe Glantz. The amount of research required for your work to be period accurate seems like it could be overwhelming. How do you keep yourself from falling down the research rabbit hole and has it become easier or harder as your career has progressed? It’s a mix. What I do is I research in layers. Which is actually the same way I approach designing a puppet show or building a novel. So I start with very broad research to kind of just get a sense of the era. And then when I begin building my synopsis, I narrow my research. As I start transferring from synopsis to outline, I get more narrow. When I actually get into writing it, there are often times where I’m like, “I don’t know the answer to this thing so I’m just going to put it in square brackets.” In the afterword of The Calculating Stars, I reference sending things off to astronauts and saying… “and then the pilot said [jargon] and I replied [jargon] and they said he [jargoned] the [jargon].” Then I would send it off and say, “Please play Mad Libs.” So, I had Kjell Lindgren and Cady Coleman doing astronaut Mad Libs and Sheyna Gifford doing medical Mad Libs, and occasionally Mars Mad Libs. You began your career in theater and puppetry and that talent is apparent in your work as a voice actor for audiobooks. How has puppetry or theater helped you in your writing? Certainly, Elma’s journey with examining her own privilege is my own journey. That is, most of the conversations that she has are conversations that someone else had with me. There’s a couple of things. One is that audiobooks are so popular these days that I know my work is going to go into audio. So I think about that as I’m writing it. It means that my fiction tends to have far fewer dialogue tags, because I know what that sounds like when it’s spoken. With puppetry we use a couple of different things to make a character look alive and it turns out that most of those play on the page. Like focus indicates thought: what your character is looking at or listening to—what they’re focused on—is what they’re thinking about. And especially when you have a first person narrator like Elma, anything that she’s talking about is the thing that she’s focused on and is the forefront of her thoughts at that moment, which means that I can control what the audience is focused on. It prevents me from having the problem that I see with a lot of early career writers where they will have the character be focused on or describing something that will be completely inconsequential to the moment. It’s like, it’s not important, why are you focused on that at the moment? So it helps me remember to keep the important stuff at the forefront of the description of things. The diversity and depth of your characters makes your writing stand out to me, something that I look for when I’m looking for novels to read. When you are writing a character that is from a background different from your own—“writing the other”—what process do you use to create authenticity rather than just be another well meaning white person explaining the situation? I try to extrapolate from things that I know, as well as doing a lot of reading. And then I also attempt to work with…people use the term “sensitivity reader” a lot and I hesitate to use that. I think of them more as expert knowledge. It’s still up to me to make sure that I am well versed enough that I’m not going to be offensive, but they can help me spot things that are emotional points that I wouldn’t think about hitting. In a lot of ways, I feel like there are always going to be mistakes that one makes, but if you haven’t done enough reading to understand what might be offensive, you probably shouldn’t be writing that character. And so one of the things that I do—like when I made the decision to have Elma be Jewish—I did that in part because it was an area that I had a personal connection, although I’m not Jewish myself. I had enough connections there that I was aware of problem areas. I already knew how to recite the Kaddish, bizarrely, because I learned it from a puppet play. [laughs] You take the knowledge where you get it. The secondary characters, the ones who are not Elma, most of them are based on someone real, to some degree or another. And certainly, Elma’s journey with examining her own privilege is my own journey. That is, most of the conversations that she has are conversations that someone else had with me. So the stuff in there that is good is the result of someone else’s emotional labor. I can take credit for it, but I don’t deserve it. Anything about the books that you’d like the readers to know? I guess one of the things about the books that I’d say is that a lot of the places where Elma was dealing with some sort of discrimination and the examples feel like they are from the 1950s, but most of them are actually from the 21st century. So it’s nice to think that things have changed—and they have—but only by degrees. The problems are all still there. Over 500 people have been in space, but only 61 of them have been women. And even less have been diverse in other ways. Right. I was talking to someone who worked at NASA about the books and he expressed dismay about some of the things, “Oh my goodness, how sexist it was,” and I said, “I hate to tell you, but at least one of the examples you just cited came from a colleague of yours.” And the look on his face of just horror was…instructive. As you’ve reached out to people in the space program and had those conversations, does it seem like the advances that need to be made in that area are getting there or are they more receptive now? Yeah. A lot of times they might not do that example anymore, but the thought process that overlay that is still there. For readers who are interested in the history of the WASPS or women in the space industry, do you have any books to recommend?